There are two ways to take or capture screenshots on the new Samsung Galaxy Alpha -- (1) using keys and (2) palm swipe. This content will walk you through a step-by-step process on how to take screenshots on the Galaxy Alpha using combined keys and by swiping your palm across the screen. You may refer to this content whenever you think necessary. Follow these steps to capture a screenshot using the phone keys. 1. Get your phone to get started. 2. Now press and hold the Home key and Power key simultaneously. Doing so will capture a screenshot on whatever is on your phone's current display. Generally, the screenshot will be copied to the clipboard and will be saved in the Screenshots folder inside the Gallery application. So, if you want to share any of the screenshots you've taken on your device, just access the Gallery app's Screenshot folder. Another way to capture a screenshot on the new Galaxy Alpha smartphone is through palm swipe, or by swiping your palm across the display. 3. Touch Motion and gestures. 4. Select Palm swipe to capture. 5. Touch the switch to turn ON or enable Capture screen function on the phone. 1. Touch the screen with the side of your hand, then swipe across the screen from right to left or vice versa. Refer to the following images to ensure you're doing it right. If you've successfully captured the screenshot using palm swipe, it will be copied to the clipboard and will be saved in the Screenshots folder in the Gallery app. Just access that folder if you want to share or transfer a screenshot to a different storage. Just to make sure everything you need is covered in this content, we purposely included the following steps on how to view all your taken screenshots on the device. 1. Access or open the Notification Panel on your phone. To do so, simply swipe your finger from top to the bottom of the screen. 2. Inside the notification panel, touch Screenshot Captured. 3. Now choose and touch your desired screenshot to view. 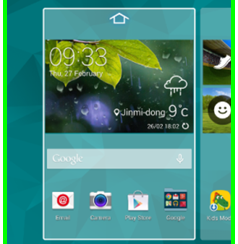 Another way to view screenshots on your Galaxy Alpha is through the Home screen. When you're in the Home screen, touch on Apps, go to Gallery and finally, touch Screenshots. When viewing the screenshot, you will be prompted with the following options/icons on top of the screen: You can use any of these options to edit a screenshot according to your preference. a. Change Player - this option allows you to play your media on a nearby compatible DLNA-enabled device. b. Share via - this option allows you to share a screenshot via Bluetooth, Gmail, Email, Messages or Wi-Fi Direct. c. Note - this option offers additional sharing options on your phone. Options may vary depending on the apps installed and enabled features on your device. d. Delete - this option allows you to delete a selected file. e. Camera - this option allows you to open or launch the Camera application. a. Edit - this option allows you to edit a screenshot. b. More info - this option lets you view information about the screenshot including the Date, Category, Location and Tags. To show or view technical information about a selected screenshot, like its size, simply touch on Details. c. Copy to clipboard - this option allows you to copy the selected screenshot to the device clipboard and paste it into other apps. d. Crop - this option allows you to crop or remove unwanted areas out of the screenshot. e. Rename - this option allows you to change the name of the file or screenshot. f. Slideshow - this option lets you start a slideshow of all screenshots in the folder. g. Set as - this option lets you set a selected screenshot to a Contact photo, Lock screen wallpaper, Home screen wallpaper, Google wallpaper or Home and lock screens wallpaper. h. Print - this option lets you print the screenshot to an available printer using wireless network, USB connection or Wi-Fi Direct. i. Settings - this option lets you view and edit Gallery settings. You can also view accounts available for syncing with the Gallery app. Just select when sync should happen. Other options you can turn on are tagging options like Tag buddy and Face tag. You can use the Notification Panel to delete, edit and share screenshots quickly. Just touch Screenshot captured using your two fingers slightly apart, and then swipe down to expand and display all options available for you to configure.